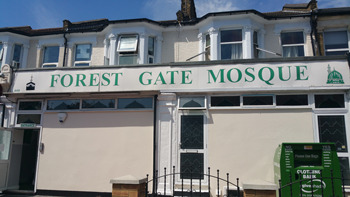 Around a quarter of Forest Gate's 30,000 population is Muslim and the district is served by 13 mosques. What follows is a lay, non-believer, account of the local mosques. We are running the feature as a step towards explaining, at a fairly rudimentary level, how a significant section of our community organises itself. 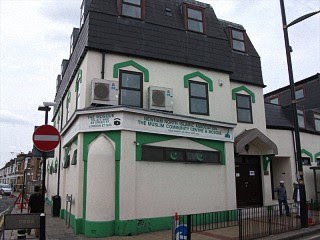 There has been a small Islamic community in Britain since the 18th century. It grew in number with the development of the East India Company, which employed a large number of sailors from the sub-continent (primarily from what is now Bangladesh) to ship goods into London. Many of them stayed and developed small communities initially around the London Docks and Whitechapel areas. 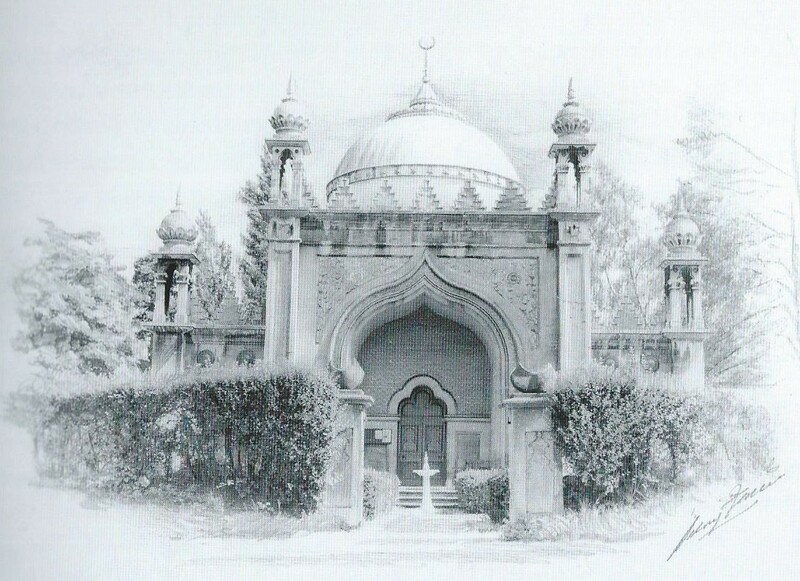 Somewhat surprisingly, however - for a range of one-off factors - the first mosque in Britain was opened in Woking in 1889. London's first mosque was opened - in Whitechapel - as late as 1941; others followed fairly rapidly, particularly since the 1970's, as the city's Islamic community has grown. Although Muslims are required to pray five times a day, Friday prayers (Salatul - Jum'ah) can only be professed in a mosque, by adult male Muslims. Women are permitted to pray almost anywhere and there is no requirement to attend a mosque on Fridays - hence the absence of provision for women in some of the buildings listed below. It is the Friday in-mosque worship requirement, together with the desire to create community centres for the faithful, that has lead to the quite rapid development of mosques in Newham (one for every five hundred or so of the faithful). 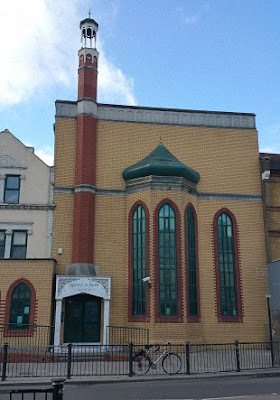 The vast majority of mosques in Britain today are not purpose built structures, but occupy previous shops, houses and other civil buildings. Forest Gate is no different from this - as the information, below, indicates. 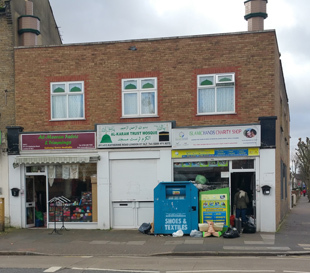 Approximately 90% of British Muslims are Sunni, and the minority, 10%, Shi'a - a position reflected in the distribution of mosques in Forest Gate. Deobandis and Bareilvis are the most populous divisions within the British Sunni community - largely because they are dominant in the Indian sub-continent. The Deobandis (about 50% of all London Muslims) tend to be more dogmatic in approach, and the Bareilvis favour a more charismatic approach to following the faith. 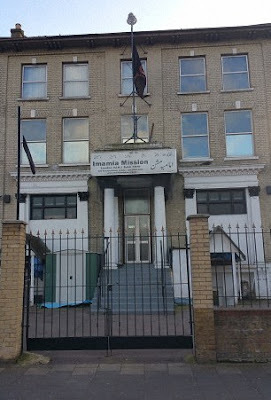 This mosque was established over 35 years ago, originally simply for Friday prayers (Jummah) and as a Madrasa for children. It was originally located in Manor Park, and moved to its current location in 1986, by purchasing a warehouse. 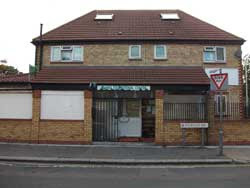 In 1999 the elders purchased bakery land at the rear (Chaucer Road), for girls' education. 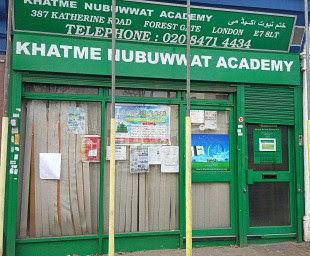 A school was established in 1999, initially as a primary school, which subsequently offered secondary education, too. It is recognised by Ofsted and currently has a "Good" rating. It, additionally, caters for up to 110 girls per week for evening education. Participated in 'Visit My Mosque Day' - 5 February 2017. 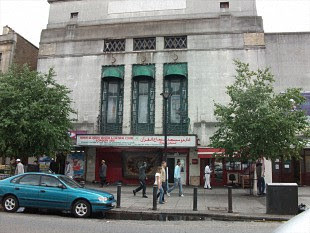 The premises was formerly the Odeon cinema (for details of its history, see here). 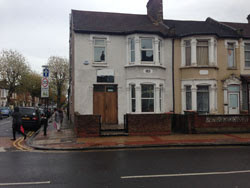 The fine building today looks particularly shabby and really could do with an empathetic facelift. The premises were formerly a house - once occupied by John Curwen, founder of the Earlham Grove Hall, and Tonic So-Fa music education system (see here, for further details of him and the system). 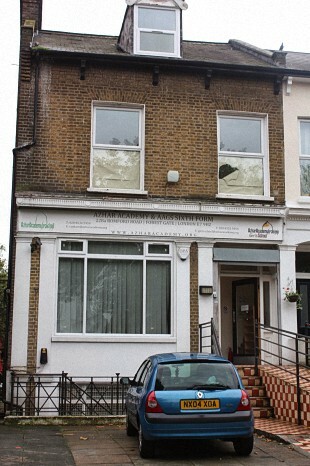 According to its latest returns to the Charity Commission, the Mosque's income is around £130k p.a. Participated in 'Visit My Mosque Day' 5 February 2017. 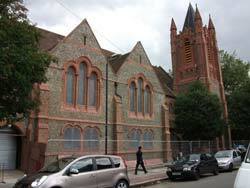 The mosque was formerly a Congregational church, and is a Grade 2 listed building (see here, for further details). The mosque also incorporates a girls' school. According to its March 2016 Ofsted judgement, the secondary school is "good" and early years provision, "outstanding". There are approximately 260 secondary school aged girls and 75 fte equivalent mixed primary pupils. Annual fees are £2,600. Further details on the building's listed status can be found here. Further details of the schools' Ofsted ratings can be found here). According to its latest returns to the Charity Commission, the organisation has an annual income of £1.18m, employs 63 people and has 53 volunteers. It is located in the former premises of a Jehovah's Witness' Kingdom Hall. 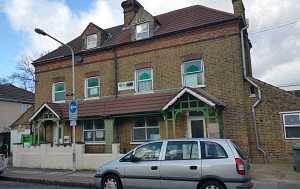 It is co-located with Iman Zakariyah Academy primary School and The Bangladeshi Muslim Shomity Ltd. According to its latest Charity Commission returns, its annual income is around £347k p.a. This mosque has recently undergone a substantial refurbishment. It was formerly a shop, and a century ago a printers/publishers, associated with then prominent Forest Gate artist and politician Charles Ward (see here for details). 411 - 413 Katherine Road. The organisation has a record of submitting late returns to the Charity Commission. Its latest set of accounts showed it to have an income of £134k, in 2015. 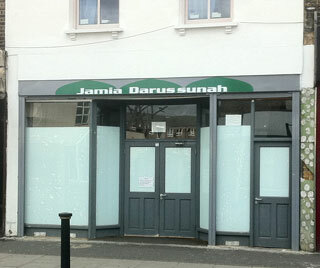 The mosque occupies a former a shop. The information in this blog has been gleaned from a number of different websites - many, sadly, out of date. It is presented in good faith by a non-adherent. We will be delighted to amend any errors within it, or add further useful information supplied to us. Sorry but which century are you living in? Surely its spelt Muslim and Moslem. I find it highly offensive that some people deliberatly insist on offending Muslims by using the spelling Moslem when no Muslim group uses that spelling due to the offensive meaning. Please stop its Islamophobic and offensive. Rupert Murdoch did the same in his recent tweets blaming 'all Moslems' for terrorism. I expected better from your blog. Surely its spelt Muslim and not Moselm. It is a transliteration from Arabic issue: a bit like the many different spellings of the prophet's name. Moslem was more fashionable in 20th century, Muslim in this. In the same way that transliteration from Manadrin Chinese had the spelling of the country's capital as Peking until the late 20th century, when it more fashionably became Beijing. Neither is inherently offensive; it is simply a question of linguistic fashion. I think its extremely offensive for you to persist and even justify the use of the ignorant term 'Moslem'. You even decide to call an organisation the Moslem Council of Britain when they themselves are officially known as the Muslim Council of Britain. How is that justified? You can't call a group by a name you choose. Especially one which they themsleves dont wish to be called and which they find offensive. I would invite you to re-word the article and use the proper and internationally accepted spelling of the word for followers of Islam as Muslim. Otherwise it smacks of the typical dinner table Islamophobia which has become more acceptable in todays society. Your justification is totally incorrect and I invite you to engage with Forest Gate Muslim and ask them what they feel. I have just noted that you have changed the spelling and just wanted to thank you for that. It is well appreciated.